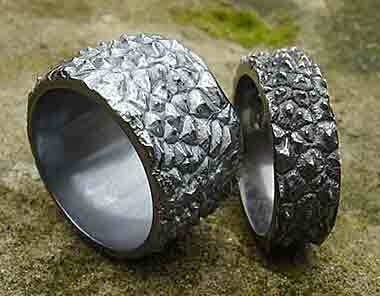 GOTHIC RINGS : BRITISH Made : LOVE2HAVE in the UK! The BEST! British made Gothic and alternative rings all handmade in the UK at prices you can afford. Increasingly we are experiencing a high number of Gothic wedding rings purchased from this section, and our Google search stats confirm the search term Gothic wedding rings as a favourite search choice for our customers. The rings in this section come handpicked as suitable wedding rings for couples looking for a very alternative design statement, and our all black rings fit this criterion exceptionally well. We sell rings made from zirconium as well as sterling silver, which allows us to cater for this end of the market. Zirconium offers not only good value for money, but it is very strong too. The black on these rings is created using heating techniques, and they have an almost magical quality in polishing up as good as new, even if slightly scuffed. We have other examples too in the men's Celtic rings category. Some black zirconium rings with gold inlays are listed too from the UK men's wedding rings section. These are at the upper end of the price range, but again fantastic value for money as they are very robust and resilient to everyday wear and tear.